St George Mews, Quiet & Serene Boutique Building Within The Heart Of The Annex, Perfect For Students Or Professionals Looking To Be In The Centre Of It All. 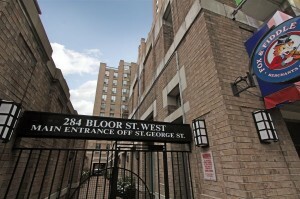 Steps To St George Subway, Yorkville, U Of T, Rom, Shopping, Restaurants, Conservatory Of Music, Cafes, Nightlife. Sun-Filled Rare Corner Unit, 9′ Ceilings, New Laminate Flooring, Baseboards, Appliances, Closet Organizers, Light Fixtures, Freshly Painted. Absolutely Best Value In The Annex. It Won’t Last! Newly Renovated Gym, 2nd Floor Terrace/Patio With BBQs, Party Room, Meeting Room, Storage Locker Included, Library, Craft Room. Stove, Brand New Fridge, Dishwasher, Washer/Dryer, All Light Fixtures And Window Coverings. 2 Bedrooms, 1 Bathrooms, with locker. Parking is rental only.